Efficient and effective inventory strategy is a critical prerequisite for success for every business, regardless of size, market place, or supply chain. No longer just offering a competitive advantage, the correct allocation of inventory resources are a necessity, both for customer satisfaction but also financial performance. Investments in inventory management yields large returns when they are correctly placed. By reviewing your current inventory, management environment and practices, NorthFind Management will work with you to develop an inventory strategy that is effective and sustainable. By reducing the noise from your supply chain and implementing a data-driven Plan For Every Part strategy, higher service levels can be achieved and inventory reduced. Supplementing this progress with statistical inventory optimization techniques, will ensure maximum inventory efficiency. The first stepIdentifying the different types of supply chain complexity in your business, and the relative contribution of each. Real complexity is the complexity arising as a result of exogenous factors such as customer behavior, supplier behavior, internal distribution footprint, sales channel complexity, etc. Artificial complexity is the complexity arising as a result of endogenous factors such as inefficiency, unsuitable technology solutions, poor processes design, skillsets, etc. NorthFind helps you differentiate between these two, and then helps you understand how to design an inventory strategy while eliminating artificial complexity from the system. Step 2The next step is clearly differentiating between inventory management and strategy. Inventory management is the short-term tactical response to the demand signal and operational challenges, while inventory strategy is the development of a sustainable inventory entitlement plan. Inventory entitlement is impacted by supply chain complexity, and is focused on maximizing customer service level while minimizing inventory investment requirement. NorthFind works with you to develop a roadmap to get you to that point of entitlement, where buffering for the true complexity in the supply chain, not for errors, ensures you end up with an efficient and best in class inventory strategy. Step 3The last step is use the most up-to-date methodologies to optimize your inventory. NorthFind works with you using the NorthFind multi-echelon inventory planning suite to ensure that Inventory is in the right places, in the right amounts, and in the right mix. ConclusionTurning Inventory into a Competitive Advantage. We design advanced analytics to support you in the decision making processes, helping you build efficiency and operational effectiveness through cutting edge use of current information. We benchmark your processes and compare to best practices, ensuring that you are on the right track to being best in class. Using cutting edge tools and technology, NorthFind offers meticulously researched and tested tools to help leverage available data and build your inventory strategy, allowing you to focus on your business. Analyze trends in demand, allowing for the classification and planning of each part. Identify cyclical and seasonal patterns in demand. Remove outliers and tag one off occurrences. Customizable planning strategy for each SKU, with impact on days of supply and updated in real-time. Analysis of lead time factors on safety stock requisites. Comprehensive analysis of safety stock requirements, based on an extensive analysis, including components such as demand variability, lead time variability, and performance cycle considerations.  Customer service level consideration that be set on multiple levels such as by customer, by inventory classification, or by individual SKU.